Change is one of the most popular themes in contemporary Pakistan. 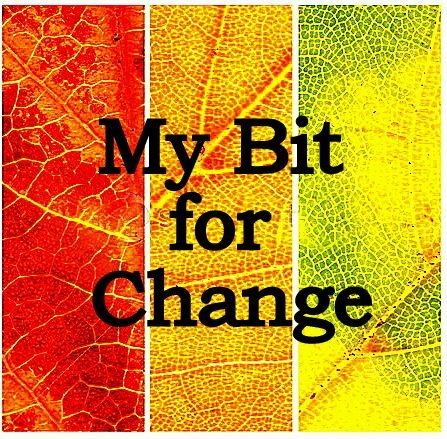 But what exactly do we mean by ‘change’, and even more importantly, why do we need it so badly? This is something that we should all learn to question. When we demand something, we should be conscious of what it is exactly. This question is even more relevant when it comes to ‘My Bit for Change’. It is common to be asked what we mean precisely by our bit of ‘Change’. It becomes eerily more difficult to respond to such questions when certain inquirers come with their own framework of change and refuse to take any other possibility as a legitimate concern for social action. I will be trying in the following lines to clarify where we stand when we talk of change. Most people see change as a one-time event. Many more view change as something that happens, not always something that is done. Others see change as all-encompassing and all-imposing, or to say; what I want for others. Some people see change as simply to challenge all things upheld in society as good and desirable. Some people see change as refusing anything that challenges established norms and values of society, whether such things are themselves oppressive and condemnatory. Some people don’t see change as anything but a simple slogan behind which the popular trend is going, while others see change as a call for irresponsible and disruptive action geared towards dismantling the social order. To accommodate all such views under a singular umbrella would be too difficult a task for even the brightest of relativists. We, however, would only consider such an endeavor to be outright pointless and directionless. Because from our point of view; when you set your eyes in every direction, you’re not heading anywhere. There is a fine line between being accommodative and accepting all opinions as equally valid. Our conception of change is one that is a life-time endeavor; a struggle; a jihad; a constant effort to improve ourselves and the world around us. There is no permanent state of perfection, at least not in this world, and we believe in relentlessly looking within ourselves critically and engagingly, and continuously improving ourselves and coming out as better human beings. We also believe that change doesn’t come, it is something you have to bring, or to invent, or to create. One should be in charge of destiny and fate, and not the other way around. We want the world to be a better place, a more peaceful and tolerant place, for all human beings whether they live in the ‘developed’ world or the ‘developing’ world; whether they belong to the majority or minority; or whether they belong to one so-called civilization or the other. Our call is a call to be human, and humanity begins at empathy; and realizing that persons other than you also feel, desire, and think, that they too have an existence as much valid as yours. We don’t consider MBFC to be an ‘Islamic’ forum, if by doing so one is dividing a Muslim population and society across lines of ‘Islamic’ and ‘Non-Islamic’, or between acts of ‘Deen’ (religion) and acts of ‘Duniya’ (this world). For the first matter, we don’t believe Muslims can be categorized against a scale telling them who is how much ‘Islamic’. It is not our job to say who is more or less Islamic, or Muslim, as this is a matter of individual conscience, as well as one’s private relationship with the Almighty. It is not in our jurisdiction, but God’s alone, to judge other peoples religiosity. Secondly we don’t believe in the duality of our faith with the matters of this world. We believe that faith is as much a matter of this world as it is of the Hereafter. From our perspective, while praying is an act of worship so is earning an honest living or spending quality time with one’s family. In this sense, we consider ourselves ‘Islamic’ not as separate, but as part of the broader Muslim society. This is not to say that we exclude the non-Muslim voice either. A non-Muslim perspective has its own validity and legitimacy in a fully functioning Islamic society. What one should grasp from the above description is that we want to bring people closer and not further apart. We are staunchly against sectarianism but also strongly against extreme polarization in society. We feel that extreme positions often fail to take the existence of another perspective into account. While religious extremism has been condemned and spoken of in media discourse; an opposite extremist discourse is also a common sight. Both depend on each other, as without the presence of the opposite, there would be little for either to say. To be exact, both speak in absolute and exclusivist terms; they talk about each other but never to each other. It should not come as a surprise that both sides have tried to attack our forum, either in the form of hate-mail to some of our writers or through certain reason-free writings. This may be taken as a cost for trying to be moderate. To be moderate, of course, is not to merely take a balanced position in the middle of two extreme discourses; it is to refuse to fall prey to either. Some may not realize this but sometimes a loud call for moderation may be the most radical attack on extremists. To refuse to fight them is to defeat them. But this is not where we end. We have continuously adopted an anti-imperialist, anti-hegemonic and anti-oppression stance. We have been very vocal against the drone attacks, as well as persons undermining their brutality, and such horrifying incidents as an American spy killing innocent civilians in the daylight of one of our major cities. We have spoken against outright human rights violations, such as the illegitimate kidnapping of our citizens, especially the case of Afia Siddiqui, and calling them ‘missing persons’. We have voiced concern for the brutal attacks on the Shia Hazara community in Quetta, as well as the tragic Badami Bagh incident. We have also spoken against various oppressive measures of state institutions and the state itself.